The Angeles University Foundation Federation of Alumni Associations (AUF-FAA) envisions to enkindle meaningfully and relentlessly the loyalty, commitment, solidarity and zest of the alumni to the University in service to God and Humanity. 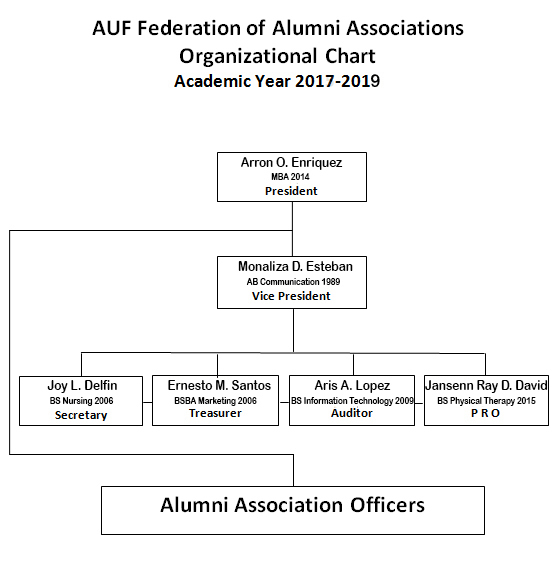 The AUF-FAA serves as an active and supportive partner of the University in developing and promoting the synergistic interaction between and among the alumni in support of the University's mission of "Total Development of Man for God and Humanity." Promote the existence and importance of the AUF-FAA to the students and alumni. Encourage active participation and involvement of alumni in the activities of the University. Undertake civic, social and religious activities that will mutually benefit the member and the community. Recognize the alumni who manifest unfaltering commitment to give honor to the University.